As the Indian government pursues its ambitious national ‘smart cities’ agenda, it would do well to contemplate how best to serve the needs of the ordinary people who matter and make these cities. 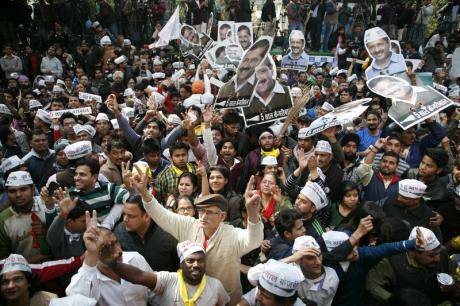 Celebration on the streets as AAP wins in Delhi, February, 2015. Demotix/anil kumar shakya. All rights reserved.On 14 February, Arvind Kejriwal was sworn in as the Chief Minister (akin to the role of a mayor in most cities) of Delhi exactly one year after he resigned from the position following only seven weeks in office. It is estimated that the swearing in ceremony was attended by approximately 100,000 people following a landslide win by the Aam Aadmi Party (AAP) that Kejriwal leads. The AAP won 67 out of 70 seats, the highest proportion ever by any party in Delhi elections. Why did Delhi’s electorate of 13 million voters choose to vote so unequivocally for a politician that had seemed to let them down by resigning so quickly when last in power? While analysis on the election results has proffered a range of arguments from leadership style to anti-incumbency factors, one reason that stands out is that the AAP appeared to care and engage more with non-elite voters in the city on issues that really matter to the majority: water, electricity and basic public services. And this reason has implications for the ‘smart city’ agenda in India but also for cities and urban politics elsewhere. Aam Aadmi Party literally translates as ‘Common Man’s Party’. First established in 2012, the party adopted the broom as its electoral symbol (designed to engage with illiterate voters, these symbols have special significance in India). Symbolically, this connected the party to Delhi’s large community of sweepers, a historically marginalised group. This symbolism was also matched by active engagement with the voices, demands and preferences of the urban poor and lower middle-class, groups that in Delhi form a large proportion of citizens but whose interests scarcely surface in the consciousness of mainstream media and politics. While Delhi is the only Indian city in the Metro Monitor’s list of 30 faster growing metro-economies in the world, 85% of the population of the city works in the unorganised sector. A vast portion (estimates are debated) also lives in informal settlements or neighbourhoods termed ‘resettlement colonies’ where some people have been allotted either small plots of land or small flats after the settlements in which they lived were demolished. Most of these areas face acutely inadequate water supply, sanitation, electricity and other basic public services. AAP’s emphasis on water and electricity echoed with these voters. One of its first moves since taking office has been to ban slum demolitions, a move that has reiterated its engagement with the vast ‘hidden’ majority in the city. While there are debates about the sustainability of AAP’s rhetoric around public services, it is clear that these issues are important to ordinary people in the city. And this is likely to be the case, not only in Delhi but through most Indian cities. As the Indian government pursues its ambitious national ‘smart cities’ agenda, it would do well to contemplate how this can best serve the needs and improve living conditions for the ordinary people who matter and make these cities. The AAP’s campaign has been credited for being effective despite not having much leeway with the mainstream media. The party made extremely effective use of social media and new communications technologies to connect with potential voters and donors. But it also relied on a massive army of volunteers for door-to-door campaigning. It held meetings and rallies across different parts of the city in different types of neighbourhoods, consulting with voters on what they actually wanted. AAP started the ‘Delhi Dialogue’ series of conversations about what people actually wanted from the city. It claims that many of these conversations and consultations led to the formulation of its manifesto. It also had campaign songs, drawing people in to the near-carnival or festival-like nature of its rallies and processions. Its success was partially as a result of its ability to actually reach to people face to face. In a country where only 16 per cent of the population has access to the internet, it is important to keep in mind that ‘smart’ technologies may only reach certain sections of the population and think about ways that this can both be supplemented and expanded. On the day of his swearing in, Kejriwal tweeted “I will devote myself 2 finding systemic solns to Delhi’s problems n implementing them. This includes tech as well as governance solns”. This followed from a campaign that focused on many issues and ideas related to governance including anti-corruption measures, more powers for Delhi, local area development funds to be run by citizens, and mohalla sabhas (neighbourhood committees). While it is too early to assess how implementable or successful any of these ideas will be (and indeed the party itself appears to be struggling with internal strife soon after taking office), they demonstrate that taking governance seriously resonated with voters. Of course, technology offers enormous potential to improve infrastructure and public service provision around many of the issues highlighted in this election such as water and electricity, especially in terms of efficiency of resource-usage potentially leading to better provision. But technology in itself will not be the panacea – it is how it is used, by whom, and for what purpose that will determine whether Indian cities improve. While planning for its ‘100 smart cities’, the Indian government would do well to think carefully and creatively about how these cities will be governed. Indeed, as these governance diagrams created as part of Urban Age research demonstrate, governance structures in Delhi are exceptionally complex and fragmented. It is easy to think of AAP’s success as an example of turbulent dramatic politics in an Indian city. However, the experience and insights from its campaign are relevant beyond those national confines. The ‘smart city’ idea is being promoted in Africa and used in developing world contexts. As ‘smart cities’ are increasingly considered to offer solutions for rapidly urbanising regions, planners and governments will have to address how they relate to urban residents in those areas. Commentators have asked how Delhi’s electorate could possibly vote in AAP again. The answer is surprisingly simple – it is because the mainstream established parties did not appear to care sufficiently about the ordinary people or the ‘common man’ in the city. As many world cities experience increasing fragmentation and inequality of opportunity, that is a process that could have parallels anywhere, from Lagos to London.